Garden edging is a boon for gardeners as it allows them to not merely define the contours of their gardens, but it also helps in preventing the entry of animals into the lush and verdant spots. Your lawn or veggie garden tends to appear more beautiful when you edge the borders as it helps in adding a graphic touch to the landscape. When you are thinking of edging your gardens or flower beds, you can grab almost anything that’s available, and that includes stones, rocks, up-cycled wood, bottles, and brick. Brick is one of the most affordable items you can grab when planning to edge your garden. Looking at its popularity, we have curated a cool collection of 18 brick garden edging ideas for your benefit. Do have a look at them carefully. If you are planning to build a beautiful brick garden, then the best way is to create brick edging that would separate your lawn area from your flowers and plants. The image above shows how one can add a decorative touch to their garden landscape by using double edging technique with bricks. The gardener has built a double edge of bricks first, in a horizontal manner, and then simply laid out the bricks flat on the ground. The edging seen here is simple to install. For this, you would need to collect ordinary bricks, and then, you have to place these horizontally. Afterwards, you need to lay the bricks vertically on the outer ring. And you are done! The image above shows a garden whose edges have been bordered flat with bricks that lend it a handsome look and also help in creating a boundary between garden and grass. The best part about this flat edge design is that you can mow your garden easily without having to worry about breaking or chipping off portions of the edges when you move your mower. The design also works as a paver and bricks are the best choice. Laying the design is simple but make sure that the brick edges have a solid foundation that can be achieved only when you lay a paver base of stone dust before cementing the bricks. If you have always wanted to know how to build a brick garden bed, you have arrived at the correct spot dear friends! 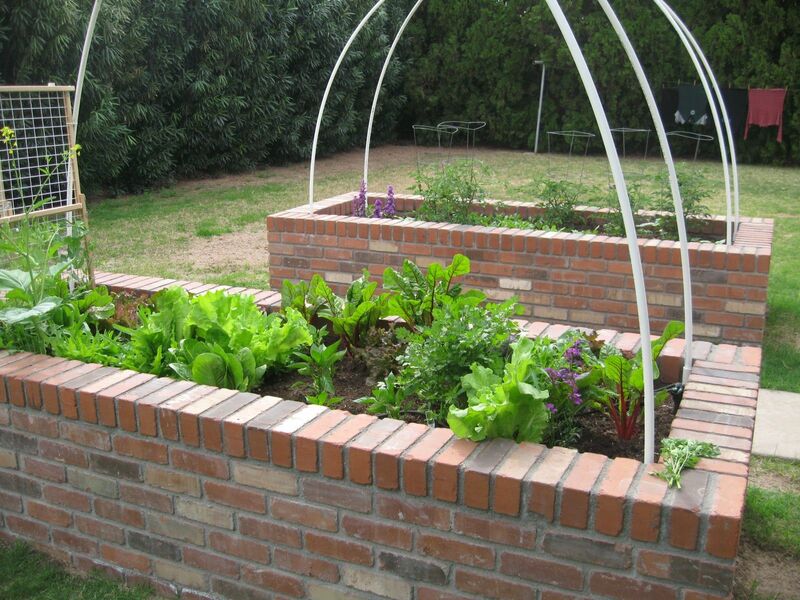 The above picture is that of raised veggie garden beds which are made entirely of bricks. For these brick walled raised beds, you would have to first earmark the location, and then lay out the wall by positioning bricks without mortar. Then, set two bricks at either ends of the selected spot by setting these on mortar, followed by laying all the bricks in the row. Keep on adding layers. Once your desired height is achieved, brush off any remaining cement or mortar from the brick wall you have built. The above image is that of a charming brick garden where the main component used is brick. The edging of the garden is made entirely of bricks that are laid vertically and are without a slant. The garden also features raised beds that are also made of bricks. If you are not fond of using mortar, then you can do away with it, and instead use brick or concrete adhesive to stick bricks together. The garden looks neat and very well maintained. Brick garden edging ideas can enhance the look of your gardens by adding contours to them. As you can see, the garden above has been landscaped with brisk edging in a slanting way. The whole design is simple, but makes the garden appear neat and well maintained. In any case, you have to use mortar if you want your edging to look the best and last for a long time. Brick is one of the most desirable components of garden edging and there is no reason why you shouldn’t use it this time when you build your garden. The laid brick edging seen in the garden above looks quite formal and is pretty simple to assemble and build. There are no decorative or intricate designs, but a minimal look which suits all pockets. For this simple laid brick edging, you don’t need mortar. Gardens with brick decor look beautiful, stylish and in tune with contemporary lines. 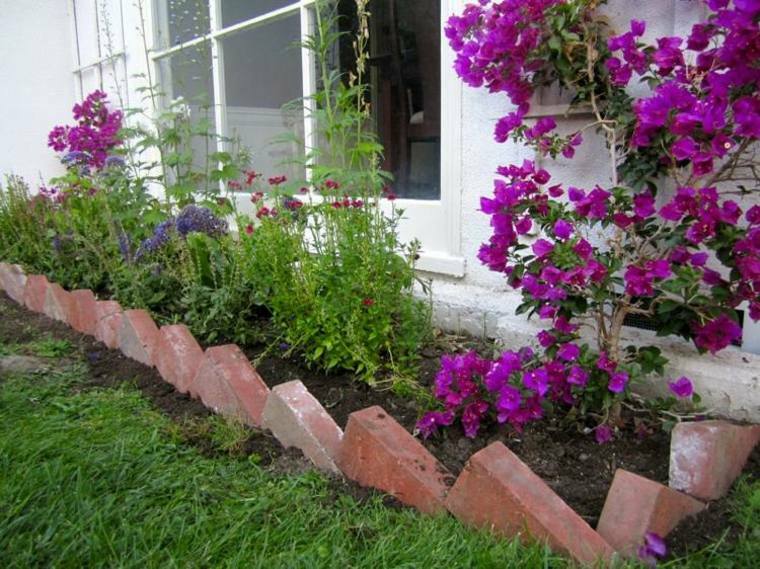 You can use bricks not just for raised beds for growing flowers, but can also use these as edging. This is what is seen in the garden above where the gardener has made use of bricks for garden beds as well as for edging. The result is awesome and you get yourself a chic landscaped garden by not spending a bomb! Garden beds can be decorated with stylish brick edging to give them a proper boundary and shape. As far as bricks are concerned, there are many types that you can use in edging, like red, grey, white and colored. But, the color white has a unique charm unbeatable by others. In the above image, the garden bed sports a roundel or circular light brick edging that is still in the process of getting built. The circular design makes it look really nice and sets it apart from the rest of the garden. If you want to lay your hands at some of the coolest brick garden edging ideas, then you must take time and sit on the net that is flooded with fantastic ideas about garden edging such as edges with diagonal brick design. Now a days, the diagonal brick edging is in vogue as it lends a dash of attractiveness to any landscape. This kind of design is also called angular. For building the above edging design, you have to dig a trench after which coarse sand has to be put for allowing drainage. Then, the bricks have to be placed at about 45 degree angle. Now, you need to fill the trench with soil. Wondering how to build a brick garden bed as charming and attractive as the one you see in the picture above? Well, its not a difficult job as its custom made and sold at a reasonable price. The company designs molds made of recycled plastic materials which are then used for producing different kinds of brick designs. The above brick edging design looks very ornamental and decorative. 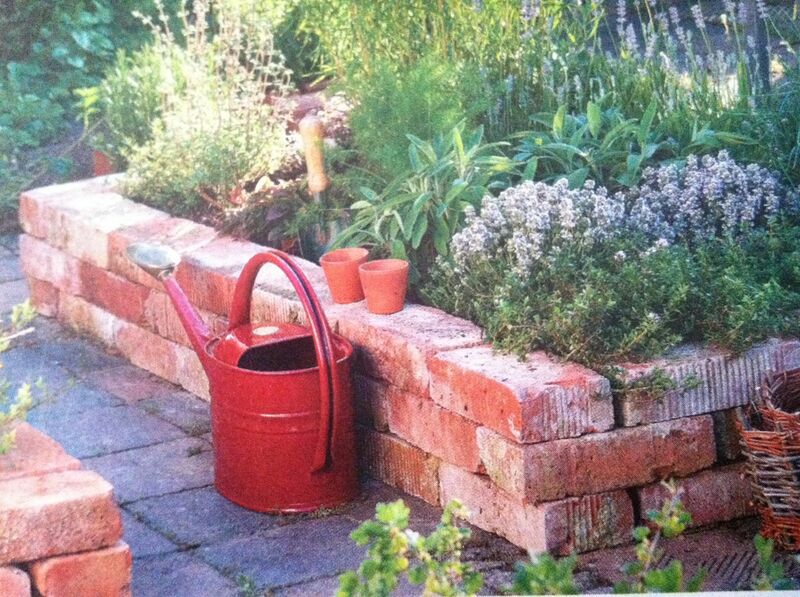 You can highlight a particular spot in your garden using these bricks. The garden beds in the picture look heavenly and have all been edged with bricks. Bricks, as we all know are an all time favorite element in landscaping because they look traditional as well as are resistant to weather changes. 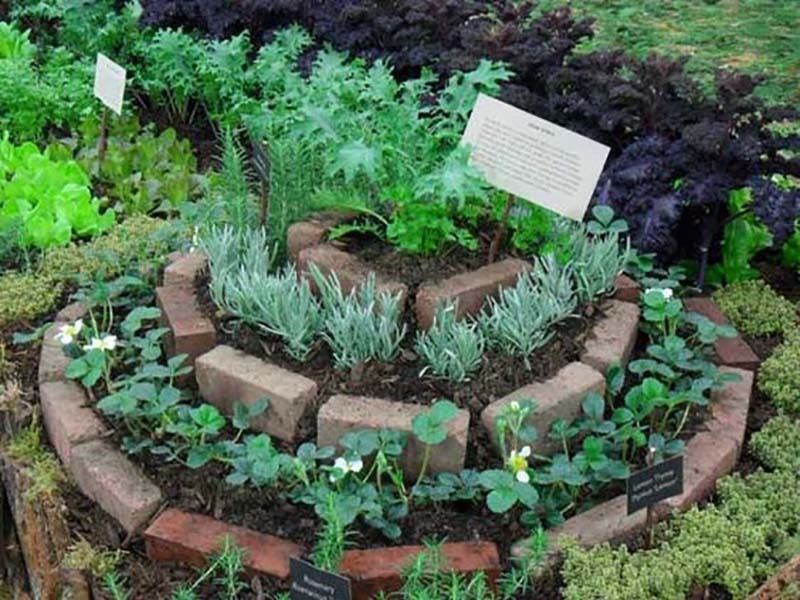 In the image, each garden bed is edged with two tier layout of bricks. The use of mortar isn’t ruled out here. The brick walled edging seen in the garden above has been done with reclaimed bricks, i.e, bricks that have been recycled. The garden or lawn edging looks stylish and is suitable for any kind of landscape, whether traditional, contemporary or Victorian. The side way too features a garden bed sporting a brick edging. Looks like this brick edging design is going to be loved by you all as it features bricks that aren’t bog produced, but are instead – reclaimed and recycled. These bricks are ornamental in style and lend a charming touch to the garden’s edge. A very good example of brick raised garden bed without mortar will be the garden edge shown above. 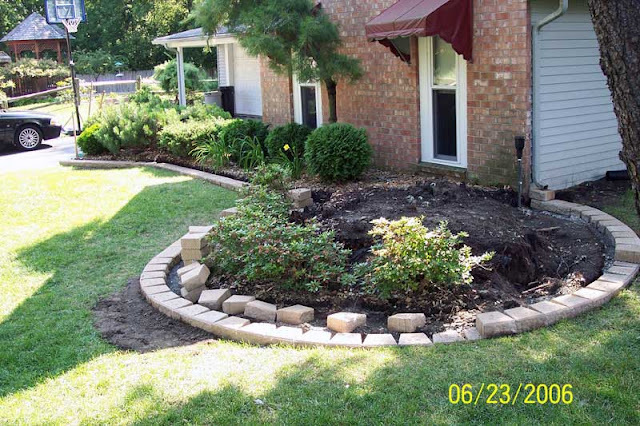 The spiral shaped or circular brick garden edging makes use of no mortar as its not a necessity. However, using mortar makes the edges long lasting and more resistant to weather. 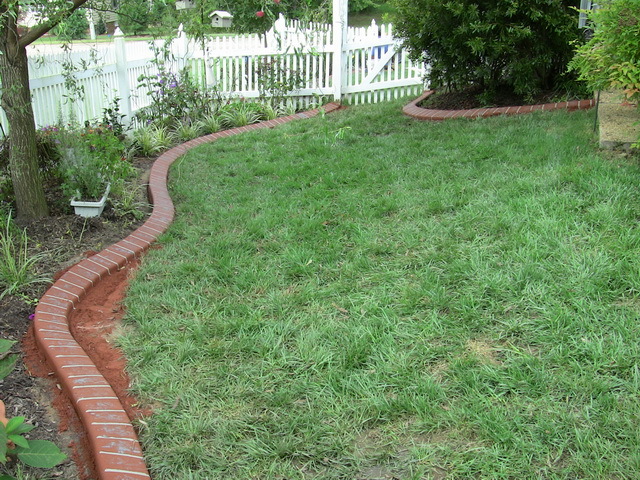 For this spiral edging, you can use bog bricks or reclaimed ones as you desire. 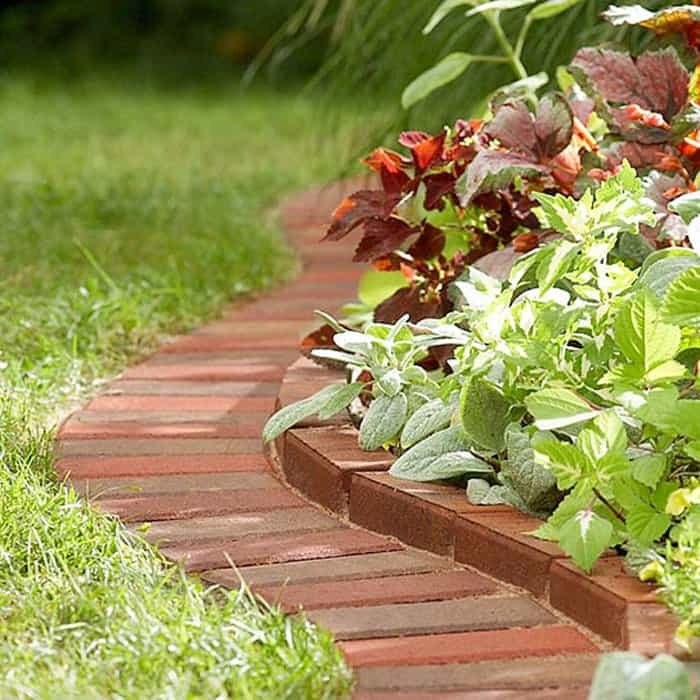 Brick garden edging ideas can be used anywhere in the outdoors like pathways, edges or garden beds. The brick edging seen here is built around and under a tree to grow plants and flowers. The gardener has optimally utilized the space underneath the tree for planting greens and he has opted to use bricks for bordering. The whole design looks pleasing. You can highlight any spot in your garden using attractive edging such as this one in the picture. The garden bed featuring colorful flowers has been bordered with three tiered brick layout that lends it a height and makes it difficult for strays to enter it. The red color looks rather enticing and very traditional. If you are bored with red and white bricks while landscaping your gardens, then you can give grey a try as this color truly brings out the beauty of any feature. The above picture shows a garden that has been edged using grey inlay of bricks in vertical style. The landscape artist has thrown in other shades like white and red to offer a great contrast. The above picture shows a garden that features a brick raised garden bed without mortar. Mortar basically helps in binding the bricks together and makes the design resistant to weather. However, when mortar is not used, the edging design tends to look rather shabby as in the image. But, the garden bed definitely looks rustic which is a good thing if you like your landscape a bit different than others! Garden edging adds a whole new look to any lawn or garden and must be done so as to offer protection to the plants. Among other things, brick is one component that is readily available and comes at a cheap price. From using ordinary, to reclaimed to ornamental bricks, we have offered you a wholesome kaleidoscope of fantastic brick garden edging ideas, which, we are sure will help you quench your thirst to do something unique with your gardens.